his live recording is part of a cycle of oratorios and masses, performed in the basilica of Maulbronn Abbey under the direction of Jürgen Budday. The series combines authentically performed oratorios and masses with the optimal acoustics and atmosphere of this unique monastic church. This ideal location demands the transparency of playing and the interpretive unveiling of the rhetoric intimations of the composition, which is especially aided by the historically informed performance. The music is exclusively performed on reconstructed historical instruments, which are tuned to the pitch customary in the composer's lifetimes (this performance is tuned in a' = 415 Hz). The Mass in B Minor BWV 232 is best thought of as an anthology, a collection of his "best" sacred music that Bach assembled in the last years of his life. During the 1730s and 1740s, Bach put together several such kunstbücher (literally, books of art); the most widely known are The Art of Fugue, the four volumes of the Clavier Übung, and the 17 Chorales of Different Kinds. Some of these anthologies Bach either published or intended to publish; others, like the Mass, he did not. These less "commercial" distillations he left to his heirs, physical and spiritual, to preserve and disseminate to those who were interested. With the exception of the opening four measures of the first "Kyrie", it seems that every movement of the Mass is a reworking of an existing vocal composition, either sacred or secular. At least one such movement, the "Crucifixus", dates to the Weimar years. The "Kyrie" and "Gloria" were put together in 1733, as a presentation piece to the Elector of Saxony and King of Poland, from whom Bach sought, ultimately successfully, the professionally and socially invaluable position of Court Composer. The "Sanctus" is a careful and subtle revision of the setting of the text that he wrote for performance in Leipzig on Christmas Day, 1723. The "Symbolum Nicenum" [the "Credo" section], and the concluding movements of the Mass were added in the late 1740s, when both Bach's eyesight and his health were failing. The "Kyrie", the "Gloria", and the "Symbolum Nicenum" are all in five voices; the texture expands to six voices in the "Sanctus" and eight in the "Osanna". As Joshua Rifkin's controversial, but as yet unrefuted, findings have demonstrated convincingly, the Mass in B Minor, like almost all of Bach concerted vocal music in fact, was meant to be sung by one singer to each line, even in the "choruses". The principle is a simple one: Each performer got his own part, no matter how big or how small his rôle, and he shared that part with no one else. The complement of five "soloists" has caused numerous problems over the years. Who, for instance, sings the "Laudamus te", which is assigned to the second soprano, in a performance for which only one soprano soloist has been engaged? The soprano or the alto? Elly Ameling once remarked in a radio interview that it was the soloist who made the mistake of looking at the conductor first when the aria came up at rehearsal. Many conductors, however, assign the two bass solos to different soloists, when Bach calls only for one bass; the reason is simple: The "Quoniam" lies lower in the main than the "Et in spiritum sanctum". While assembling the second half of the Mass some ten to fifteen years after he delivered the parts of the "Kyrie" and "Gloria" to the Court in Dresden, Bach was not concerned about making the compass of the two arias comport comfortably with one another. Although many, if not all, of the components could have been, and were, performed as parts of the various Leipzig church services for which Bach provided the music, he gave no complete performance of the B Minor Mass, nor, apparently, did he ever intend to put one on. It is, therefore, supremely ironic that this, Bach's own distillation of his "greatest" vocal music, apparently did not receive its first complete performance until more than 100 years after his death. Haydn owned a copy of the Mass. Beethoven unsuccessfully sought to obtain one. Spontini put on a performance of the "Symbolum Nicenum", through the "Et resurrexit", in Berlin in 1828, with 92 in the chorus, 56 strings, clarinets, horns, and bassoons, but no trumpets or oboes. Under the direction of Carl Friedrich Rungenhagen, the Berlin Singakademie gave the "Kyrie" and "Gloria" in 1834, and the balance of the work the following year. 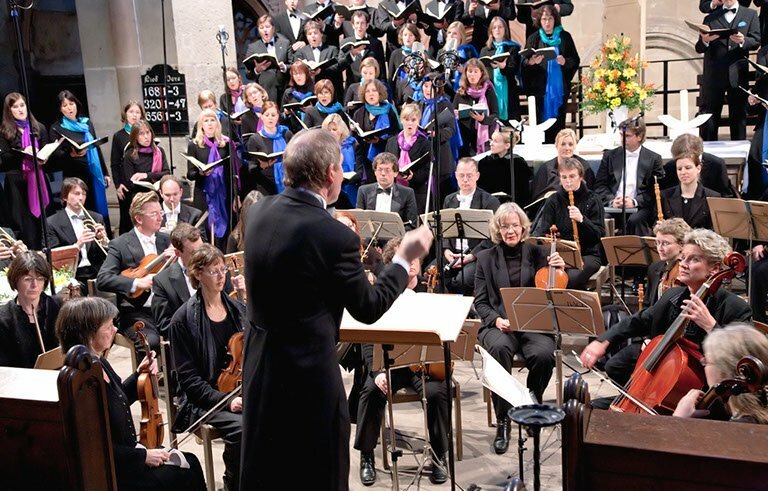 Portions of the Mass were performed at the Birmingham Festival as early as 1837, and the Mass was among the works regularly performed by the London Bach Choir, which was founded in 1876. The first complete performance of the B Minor Mass in the USA was given in Bethlehem, Pennsylvania, by The Bach Choir of Bethlehem, under the direction of its founder, Dr. J. Fred Wolle, in 1900. This first public presentation of the Mass in America inaugurated an annual series of festival performances of the work that continues in Bethlehem to this day. For three decades, from 1939 -- seven years after Dr. Wolle's death -- until 1969, The Bach Choir was directed by the distinguished Welsh choral conductor, Ifor Jones. His forthright, Romantic reading of the score -- chockerblock full of rubatos and ritards -- was recorded in 1960 . Even though it is clearly his own interpretative handiwork, Jones's performance preserves many of the interpretive traditions and conventions that had been established by Dr. Wolle in his 32 years at the helm of the Choir, traditions and interpretative quirks that have been almost completely expunged, alas, in recent years. The first "Kyrie", for instance, is preceded by a Moravian chorale. Intoned softly off stagby a brass choir, the hymn setting gives the pitch to the chorus, which comes in, forte, on the chorale's final chord. Un-Bachian though it may be, the effect is undeniably overwhelming. A very large but exceptionally well trained amateur chorus -- more than 175 singers -- is balanced against a smallish orchestra made up largely of members of the Philadelphia Orchestra, including such distinguished instrumentalists as hornist Mason Jones and oboist John DeLancie. The vocal soloists are average; only the golden trumpet of soprano Lois Marshall stands out. In better voice than she was three years earlier when she sang the soprano part for Eugen Jochum, she is assigned the "Laudamus te" in addition to the music normally given to the first soprano. This important documentation of the Bach Choir of Bethlehem's approach to the Mass before it was diluted by a much more recent director's preference for "authenticity" rather than local tradition is also a satisfying reading, one that will prove particularly appealing to those who like Bach played "with the heart on the sleeve" as the old saying goes. Copyright © by Bach Cantatas Website. Contributed by Teri Noel Towe (December 2001). Written by Teri Noel Towe, and originally printed in "Choral Music on Record", edited by Alan Blyth (Cambridge University Press, first published 1991). The copyrights in this article belong to the Cambridge University Press. I am bowled over by the quality... Fantastic! 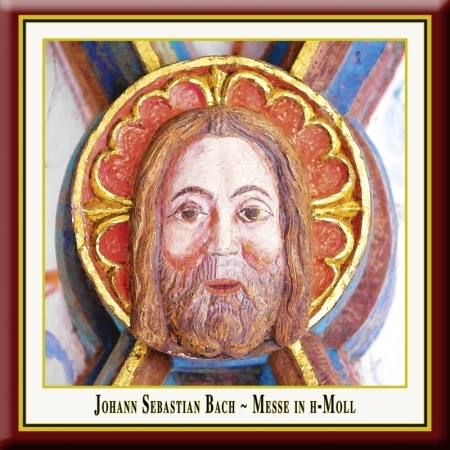 As always this enterprising German company issues beautifully recorded CD sets of choice and eclectic music but it has reverted back to its original oratorio and sacred course with this monumental recording of Bach's sublime B Minor Mass. The recording in the wonderful surroundings of the Maulbronn Monastery is nothing less than superb with ideal balance between chorus and orchestra and with the soloists on pretty much top form throughout.